Air Canada has updated their iOS app with some enhancements and bug fixes, highlighted by Passbook electronic boarding passes now auto displaying after you’ve checked in. 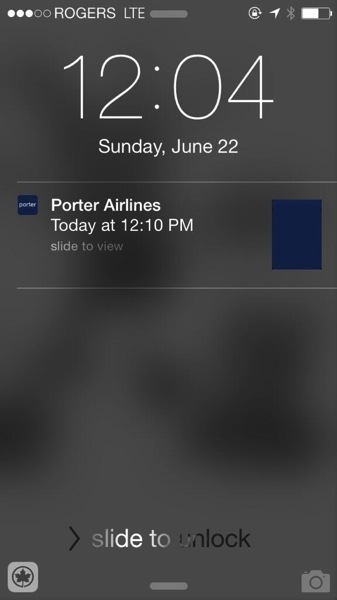 Once users check-in within the app and your Passbook boarding pass is saved, it will now appear on your lock screen. Other enhancements include the disabling of auto correct on certain fields during check-in plus the addition of the numeric keyboard on relevant fields. A new feature is a checked baggage allowance calculator, plus other fixes for iOS 7. – Your Passbook Electronic Boarding Passes will now appear automatically after you complete your Mobile Check-in! Just tap ‘Add’ to save it in your Passbook so they appear on your lock screen and can be used offline. – We’ve added a handy checked baggage allowance calculator to our app. You can find it by accessing the ‘More’ tab. – Updated Seat Selection and Seat Preview options to only appear when available. – Updated Offline Schedule download options to better reflect our passengers’ needs. – Fixed swipe-to-delete animation in iOS 7. Air Canada first added Passbook support to its app back in October 2012. Click here to download Air Canada for iOS—it’s free.